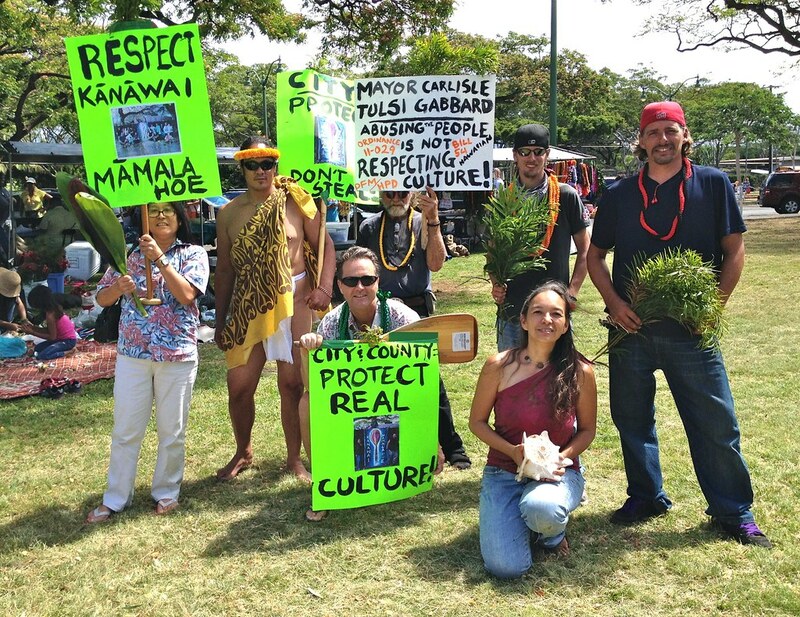 Peace activist and Hawaiian cultural practitioner Laulani Teale was arrested during the City of Honolulu's annual Lei Day May 1 festival at Kapiolani Park when she and a group of 6 protesters including artist Michael Daley tried approaching Mayor Carlisle to ask him to return the Kānāwai Māmalahoe banner and other artwork the police and City crews unlawfully seized from the (De)Occupy Honolulu encampment. Teale was the only one arrested. Teale had made a public request for a demonstration at the Lei Day ceremonies in which she and her mother have participated as lei makers for many years. The group remained in front of the Police Department until Teale's bail was posted by an anonymous benefactor. Teale returned to the (De)Occupy Honolulu encampment to participate in their May 1 program. Before returning to the encampment, Teale filed a theft complaint against Westley Chun, the Director of Facilities Maintenance who lead the raid on the encampment and targeted the untagged art tent and its contents of three major pieces of artwork, and art supplies. The artwork was videoed being placed in a storage bin (either 77 or 78) but paint and other professional art supplies were put into the dump truck for disposal. Thanks so much for the post and bringing awareness to this! People putting themselves on the line for people's rights is so important right now. Would be great if the video had just a clip of the arrest as it would spread the word to more people. Aloha.